Beginning of line-by-line commentary of “Aia i Honolulu kuu pohaku,” 1929. EXPLANATION OF THE FIRST LINE. Kapanookalani’s thoughts:—This land Honolulu, it is close to Nanawale, Puna, by the sea. It is a ku, a small land in between large lands. The stone [pohaku] is Lord [Haku] of the chiefess and in this word, the important idea is chiefess [‘lii wahine]. Kahapula’s thoughts:—Honolulu is on Oahu, where King Kamehameha V dwelt and those who opposed him is the Honolulu in this first line of the mele. It was here his enemies schemed and carried out all their defiant acts against him. While they knew the wish of the King to marry the chiefess Pauahi, her teacher, Amos Cooke secretly agreed to Bishop for him to meet with Pauahi without the knowledge of her parents. That is how Pauahi became Bishop’s, and this is how Bishop and his relative Lee [? William Little Lee] became dignitaries of the land. Kupihea’s thoughts:—Honolulu is a fish stone called a Kuula, and was brought here to this Honolulu [on Oahu] from the Honolulu of Puna [on Hawaii]. This Kuula was placed in the tiny land of Honolulu where an Alii called Honolulu lived, who was related to the chiefess Peleula, whose younger sister was the beautiful Waikiki. This place is mauka of the old Rawlin’s Estate. There is a bank of coral where Honolulu is; the fishing altar [Kuula] for the fish ponds [loko i’a] is on the Waikiki side of Liliha Street and between Vineyard and King Streets. The stone is related to chiefs from times immemorial [mai ka po mai]. It is a manifestation made by God. Iokepa’s thoughts:—Honolulu is a small land and a canoe landing makai of Nanawale, Puna, between two sand dunes, one on the Hilo side and one on the Puna side, called Puu Waawaa. From this Honolulu is called the Honolulu here [on Oahu] which used to be called Kou before, and after it was called Honolulu until this day. This is the meaning for the word Honolulu:—The wind is very calm [lulu] an the sea is serene; it is very fine and peaceful. Bay [? Hono] of calm sea; Hono that is peaceful. Kuluwaimaka’s thoughts:—The stone is related to Kamehameha V. Honolulu in Puna is a lowland next to the sea. Its width is perhaps half a mile long between Na Puu o Pele and Waiakahiula on the Hilo side. Honolulu is a place where you pick opihi [ku’i opihi] and pick limu [hana limu]. There is a fine spring [punawai] there and there is a foot path there. [And to think that this is but the very beginning of Kelsey’s detailed account of the explanation of the six loea of the mele “Aia i Honolulu kuu pohaku.” This is just the first line! It continues in the following issues!! Ke Alakai o Hawaii, Buke 1, Helu 32, Aoao 2. Dekemapa 5, 1929. This is a nice listing of limu and their descriptions, 1905. Please allow me to talk about some matters dealing with the poisonous limu of Muolea in Hana, East Maui. In ancient times, it did not grow profusely like it does now, and the kamaaina living near those tide pools didn’t know this was poisonous, however, this is what is known; When the children went to those tide pools and gathered the small fish [ohua] and ate them, if they ate a lot of the ohua, they grew dizzy and lay unconscious by the tide pools, and after being given medicine, they revived. Later, a man from Honaunau in Kona, Hawaii arrived, and it was he that found that this was poisonous. After all the sweet potato was eaten by the pigs, he fetched some of the limu and smeared it over sweet potato and when the pigs ate again, they died, and not one of them lived. If dogs came and licked the vomit of the dead pig, the dogs died as well; it is from this that the limu was known to be poisonous, for that limu grows in Honaunau, Hawaii as well. If you grab the limu with your fingers, your fingers will rot and fall off. The proper thing to do is to prod at it with a stick, and if it sticks to the stick, place it in ti leaves or taro leaves [?]. When that limu is touched, it shrinks and wilts, somewhat like sleeping grass [pua hilahila wale]. It is not long like the other limu, but when you look at it, it somewhat resembles the suckers of an octopus. On some sacred nights of the year, a red light is seen from those places. In the year 1841 perhaps, those tide pools were paved over with rocks, but these days, they are growing wild again and is spreading. The fish that go around that place, they don’t die, but should you eat the fish from those tide pools, you will end up dying. This is a strong poison taking effect immediately, similar to the powerful poisons of the haole, and perhaps even stronger. For this reason, the locals of that place have restricted access to that place, not allowing anyone without authority to go there. With appreciation to the typesetting boys of the press and to the Editor goes my aloha. 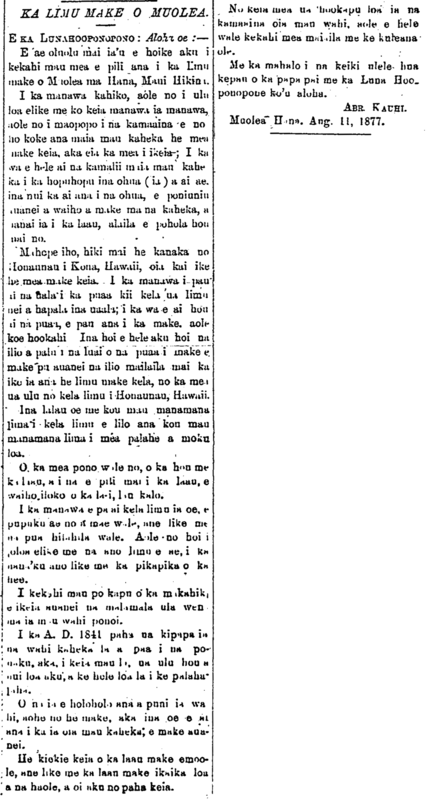 Muolea, Hana, Aug. 11, 1877. Ka Lahui Hawaii, Buke III, Helu 34, Aoao 2. Augate 23, 1877.